1. Heat the oil in a medium saucepan over medium heat. Stir in the onion and sauté until lightly browned. 2. 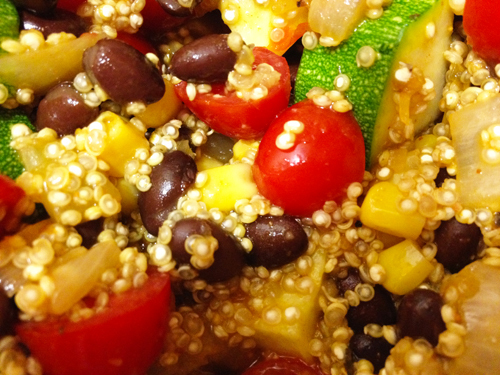 Add quinoa to the saucepan and stir constantly for 1 to 2 minutes to lightly toast. 3. Stir in vegetable broth and Texas Red, bring mixture to a boil. Cover, reduce heat and simmer 15 minutes. 4. Stir corn, zucchini, beans, tomatoes and parsley into the saucepan, and continue to simmer about 5 minutes until heated through. Salt and pepper to taste.